Can one find comfort in a priceless work of art? 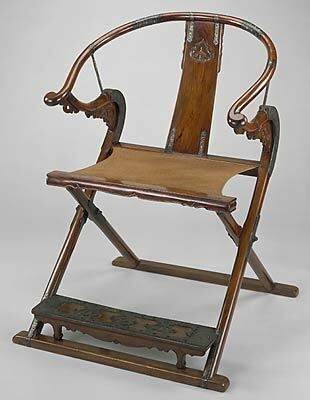 This question came to me after I saw the Chinese Folding Roundback Chair at the Minneapolis Institute of Art. Sure, there are plenty of paintings and statues at the museum. But this chair really caught my eye. First, there is the name, Roundback. Just hearing the word makes me want to kick back with a cool drink. Then there is the sleek design. Made of Huang-hu-li hardwood with iron flatware, the chair is a unique combination of utility and style. Then to top it off: the chair folds. How cool is that? If this was your favorite chair, you could take it with you. If I found some way to “borrow” this antique, I would take it to the nearest tailgate party. I wouldn’t need to know anybody for the chair would be my introduction. People would approach to admire the fine craftsmanship. They would offer me gifts of cold brats and warm beer. They would also try to hold a private audience and ask who I thought was a rising star in their fantasy football league. The entreaties would make sense. After all, the chair was built in the 16th Century for high-ranking officials. It is possible it may have been used as a portable throne. By far this is the coolest folding chair I have ever seen. Believe me. I reviewed IKEA’s latest catalog.